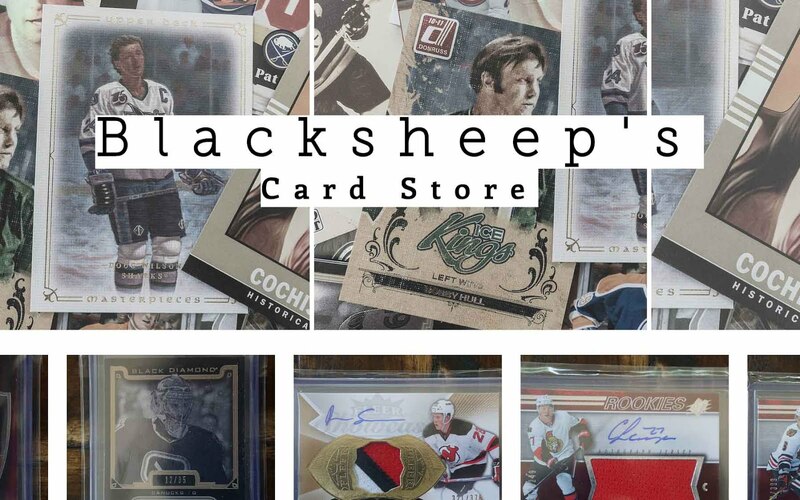 Ultimate Collection is one of Upper Deck's highest-end brands, and it has come at its usual time during the space between hockey seasons. Upper Deck releases its best products at the end of a season's cycle, so it makes sense for Ultimate Collection to show up now. As it always is, Ultimate gives collectors a high concentration of hits in a small, but pricey, package. The Ultimate Collection base card is on heavy card stock and features a design that is fresh, yet distinctly familiar. It's deep, team-centric, color scheme is in-line with Ultimate Collection cards from the past. The base cards look extremely elegant and are worthy of the name 'ultimate'. There is no mistake that these cards are of the high-end variety. Upper Deck has done a masterful job of making a base card that high-end consumers can appreciate. Each base card is numbered to just 299. The back of the base card is also outstanding in its design. It is in full color and you also get the player's image on the back. The textural feel is especially nice here. Though it's just flat cardboard, the geometric marble looking background gives a three-dimensional look to the surface. Also appreciated is the write-up of the player included here. Some high-end releases are very sparse when it comes to the back of the card. That is not the case with these here. There is a base memorabilia set within Ultimate Collection. These base memorabilia cards have numbering right after the standard base set. I would call these cards your standard jersey cards, and probably won't hold a very high value. 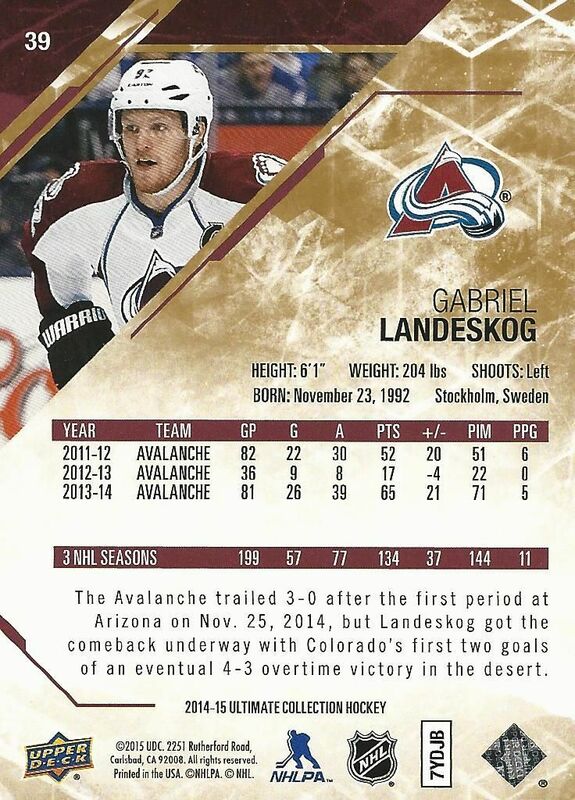 In terms of design, they are also along the lines of a standard jersey card. There's a square space for the jersey chunk right in the middle of the card. Each standard jersey is numbered to 99, but other material can be found with lower serial numbering. 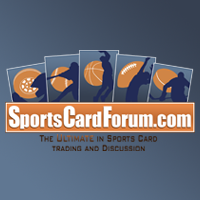 Rookie cards come last within the base set and have their own distinct design. The standard rookie base card features an on-card autograph located to the left of the player image. There's space there for a nice, large signature should the player want to take advantage of it. These rookie cards are colorful and nice to look at, but they don't stand out too much in their overall design. 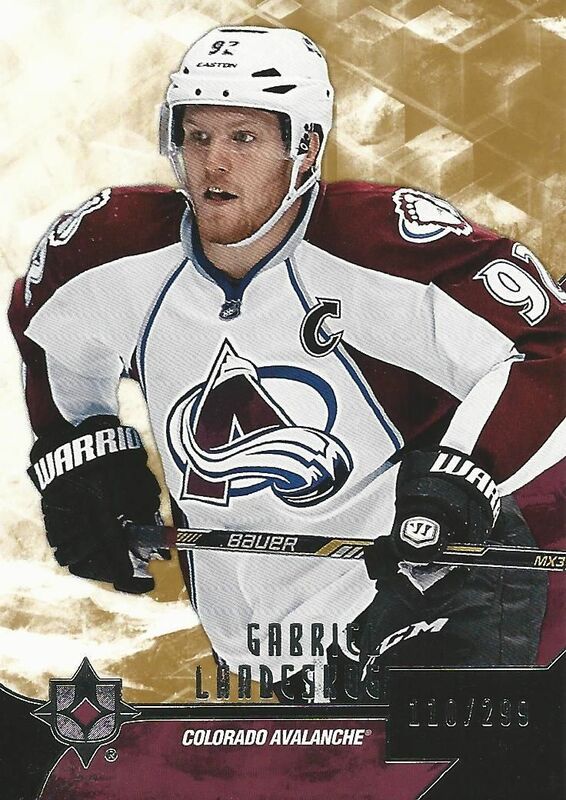 Higher-tiered rookies have lower numbering and parallels include patch pieces as well as NHL shields one-of-ones. Boxes of Ultimate Collection contain only one pack of cards. Of the six cards found in the pack, at least four should be a hit of some sort. 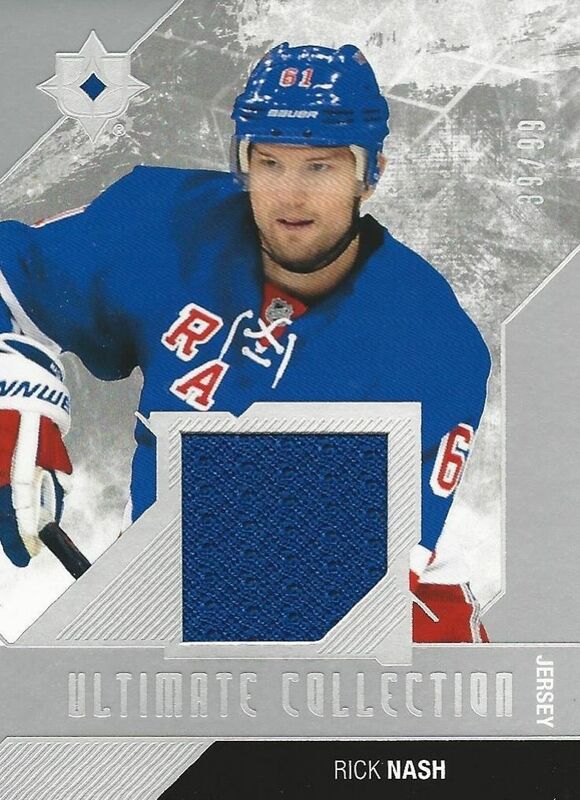 Ultimate Collection offers a huge variety of NHL game-used memorabilia embedded within its cards. There is definitely sweet pieces to find when you break into this product. 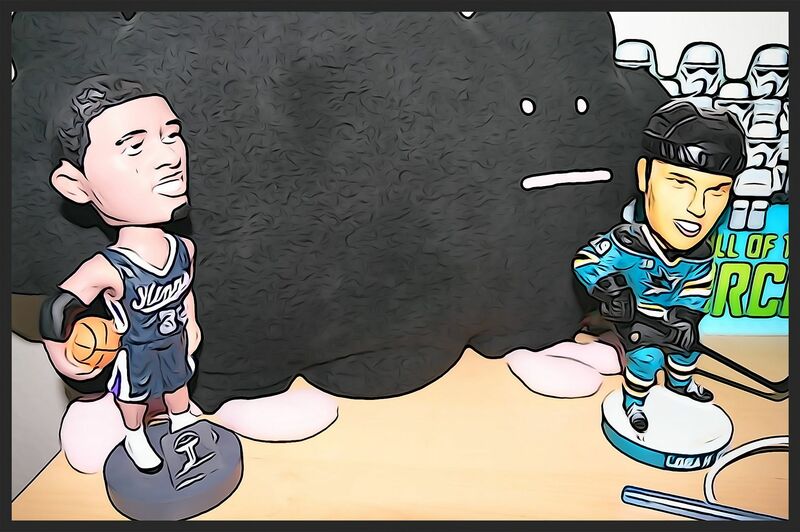 When I first opened the product in my video, I had no idea what this card was of Joe Pavelski. Turns out it is a 10-year anniversary card retro card from 04/05 Ultimate. I didn't get Ultimate back then so I didn't recognize it. It's a very sweet design though, and I'm sure if I was a fan of Ultimate back then that I would enjoy these cards even more than I do now. 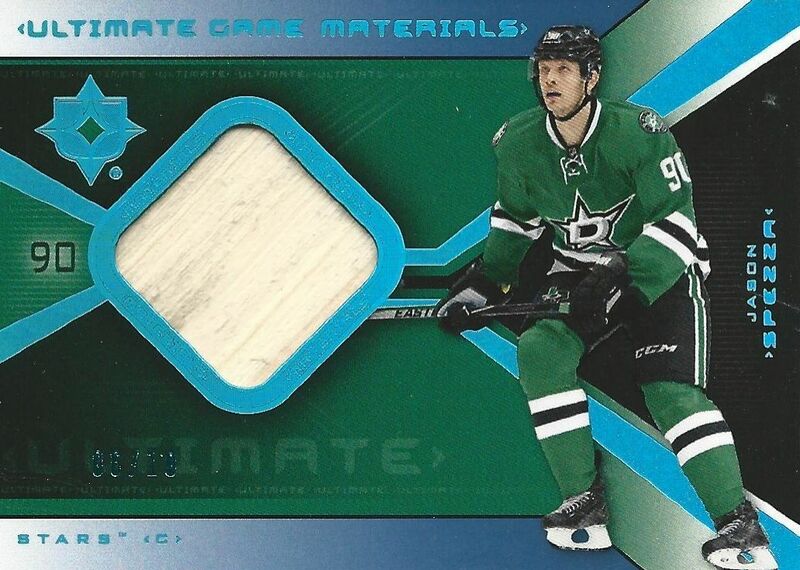 Here's a very thick card featuring a stick piece from Jason Spezza. The card is limited to only 10 copies and looks very nice with its shimmery blue foil. This type of limited numbering and quality of card is the expectation to have when purchasing a product like Ultimate Collection. Like Upper Deck has done these past few years, cards that were not put into past products have made their way into the most recent releases. 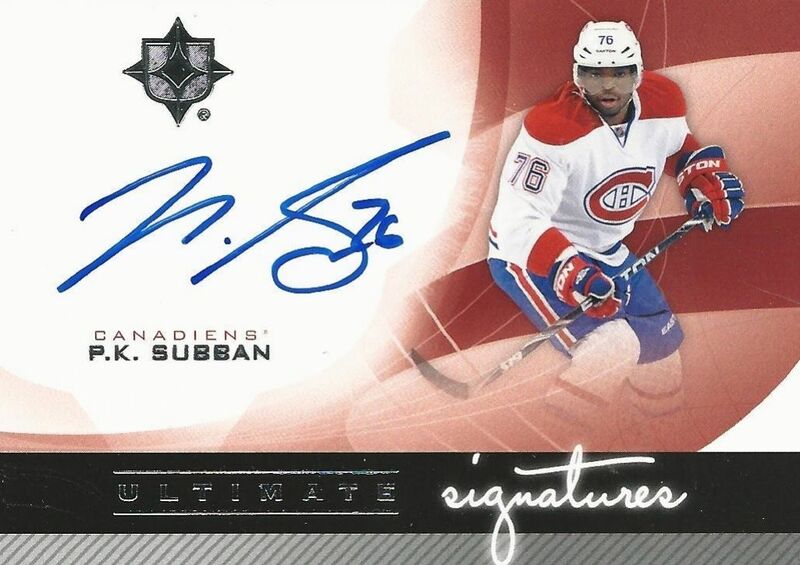 This Ultimate Signatures card was from the 2012-13 Ultimate Collection set. It looks like Upper Deck couldn't get it into that year's release so it showed up in this one. Ultimate Collection is a product that you can really hit big in. With great memorabilia pieces and autographs, the sky really is the limit here. Ultimate Collection is in the high-risk, high-reward category of products. For quite a bit of money you only get one pack. I have recommended in the past that this product should be bought by the case by collectors with deep pockets. By doing that, you guarantee yourself some nice hits. For collectors who like to risk a bit, this is a product that you can do that with. While it is a pricey product, it is still the same amount as what you would pay for an average hobby box of a product with more cards in it. This year's Ultimate Collection is again a fun product to open that looks great. I'm always up for busting a few boxes of this product whenever it comes out! Awesome review! Nice stick card!! this is definitely one of the better ultimate collections. I watch Chris open a lot of these and its almost like a guaranteed patch or stick card per box so that's pretty cool. 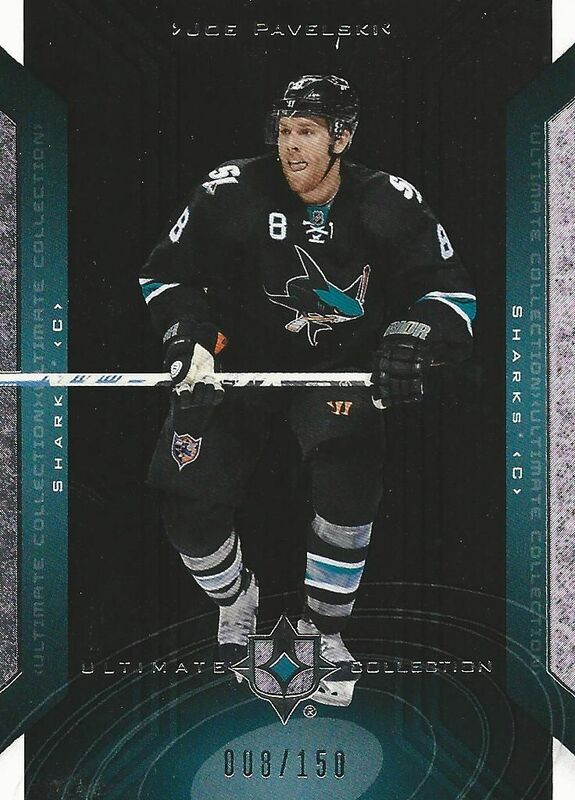 The base design is okay but I don't really like as much as previous years but overall an amazing box and to top it off the last card was good old Joe pavelski. I REALLY need to go out and buy this box! Nice break! I love the look of the base cards! How much did the box cost? Love these hits and the base design spot on. Nice Subban! They opened a couple of these boxes at my local card shop and they got some really nice cards (Ekblad Patch /25). Very nice break, and very nice product! Ultimate collection hockey is a huge hit or miss product, as most high end products are, although I think Ultimate Collection is one of, if not the, biggest hit or miss product. Thanks! I really like this years ultimate! Nice box congrats on the stick card. Love that Subban card! Nice product thanks! The base cards look cool and every hit you got has a nice look to it! I love that Spezza stick card! Great review and box! PK Subban is a good hit! Nice review and nice Spezza. I really love the new intro, nice dance! + The changed configuration, from four to six cards/box, is better since you now get at least one nice looking card per box. + The base card design is pretty good. - I don't like that Upper Deck are including cards from older sets in newer products. If they can't get them done in time, I think they should release them in a "update" product or something like that instead. 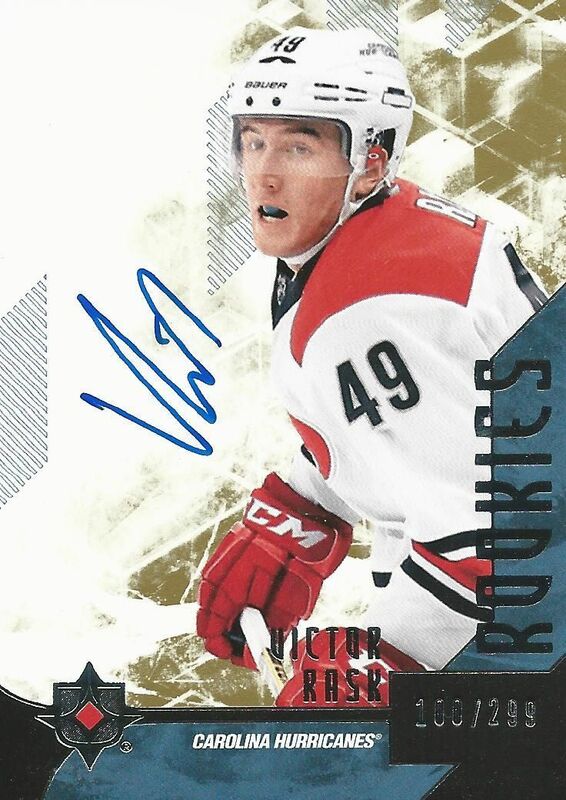 - I don't like the rookie card autograph design, mostly because of the rotated autograph. I like the intro. Thecardss are sort of different but in a good way. Nice autos. This looks so much better than last years Ultimate, and have two more cards. Great looking product. Thanks for the video and the review. Nice break! Those are beautiful looking cards. Nice box! I like how they have stick cards. Another awesome break Luke! The blue foil on the Spezza stick card really pops against the Stars' "Victory Green". Nice Subban autograph as well. Way better design than last year's product. Love the foil look. Great Channel. Love the unboxings!